It’s a New Brunswick/Nova Scotia tradition using bits and pieces of freshly harvested garden vegetable most often pepared in August. 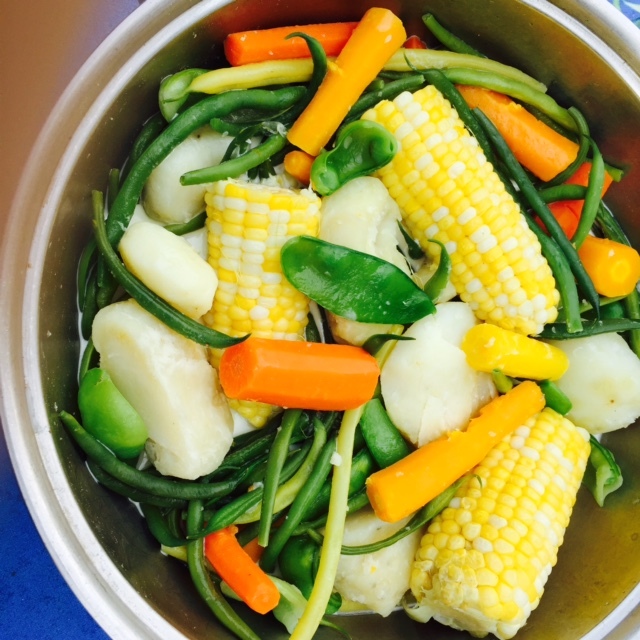 Such simple ingredients prove shockingly good with potatoes, carrots, garden beans, corn (1/2 ear per person person) peas, either sugar pod, shelled or both. The pot has enough water to half cover veggies, added step by step so none are over cooked. At the end stir in a generous dollop of cream. Since it is a hodgepodge several other ingredients are often added but we were more than pleased with this simple dish and the broth was amazing. This is an approximation of what we were served at a restaurant in New Brunswick on the Canadian U.S. border. 6 medium size potatoes (we used our Rainbow blend of two orange, two yellow and two red but excluded purple because it is too heavily pigmented. Each carrot cut into three pieces. Pour off water allowing 2 to 2.5 cup to remain and add cream, salt and pepper to taste. As with any soup recipe make it this way once and then don’t be afraid to experiment with more or fewer ingredients. This recipe fed 3 hungry adults. 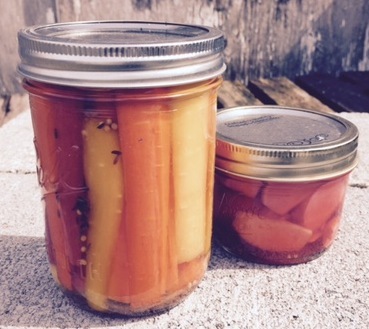 A friend brought her pickled carrots to a meeting and we all asked for the recipe. I’ve been putting in a slice of onion and a bruised garlic clove in each jar instead of the dry onion powder and garlic. I cut the carrots to fit the jar and quarter the upper part and halve the lower if they are large. The jar looks appealing as long as some of the carrot pieces are left long. The radishes are cut into quarters if they are large like a Champion and if tiny Cherriette types could be left whole. These make a nice little house gift just remind friends these should be eaten within two weeks. In a large saucepan over medium high heat, combine the vinegar, sugar, salt, cumin seeds, caraway seeds, garlic powder, onion powder. Bring to a simmer, stirring often until the slat and sugar are dissolved. Add the carrots and then bring to a boil and cook for an additional two minutes, then set aside to cool. This recipe works equally well with radishes but if combined the radish pigments will overwhelm the carrots so I cook the carrots first and reuse the vinegar spice solution to prepare the radishes. Also I add two thin slices of fresh ginger to the radishes. Once the vegetables are cool, use a slotted spoon to transfer them to a jar or bowl. Ladle just enough of the liquid and spices over the vegetables to cover them. Cover and refrigerate for up to two weeks. 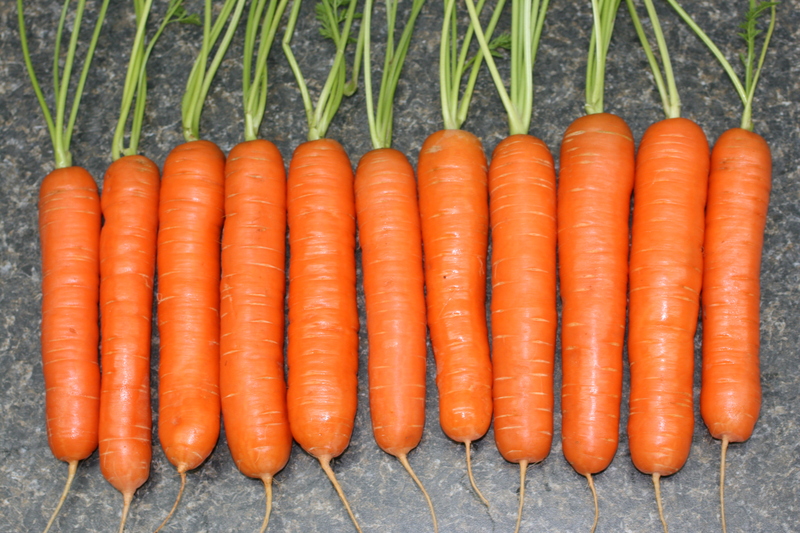 YaYa F1 Carrot is a Nantes type, delightfully crisp and sweet. The bright orange roots are so tempting I like to pull them fresh from the ground, and eat while standing in the garden. Our last summer trial plantings were so popular we hardly had any left for cooking. YaYa Carrot is a great example of modern selection and breeding. For such a sweet carrot it is unusually crack resistant. The texture has a perfect crunch that makes it a pleasure to eat. It draws admiration from all who may have forgotten how good a fresh carrot can be. It requires no complicated preparations with Vichy water and butter to coax forth flavor. Scrub and cut this carrot into sticks for enticing before meal snacks. I’ve listed these two varieties together because they share top selling honors on our Nichols Garden Nursery website. One is a brand spanking new outstanding hybrid, the other, Spinach Beet, is an ancient green. Spinach Beet is a variety we have fought to maintain in our seed collection. When there is a variety you love the best way to ensure it’s continuing existence is to grow it, eat it, share it, and talk about it. Heirloom seeds must be planted, eaten and enjoyed if the selection is going to endure. Too tender to travel to markets it almost disappeared from the seed trade for several years. Spinach beet has a small taproot with large tender leaves and stems. It combines characteristics of both spinach and Swiss Chard with lots of tender leaves and excellent tolerance to heat and moderate cold. The planting I recently made will last through the summer and into early winter. It is marvelously productive and I recommend it for container growing since it can be recut so many times. The flavor is milder than spinach and not quite as earthy as chard. This year I have never seen so many heirloom varieties disappear from the seed trade. Two apparent casualties worthy of resuscitation are Kyoto Long Cucumber and Touchon Carrot. Carrots and cucumbers require careful isolation so it is hard to produce more than stock seed on our own. Seed Savers do a fine job of retaining varieties, but often not in commercial amounts. What should we do with an heirloom vegetable we love? Grow it, buy it, eat it, and ask for it at nurseries and farmer’s markets.